Get the whole party swing dancing quick when you roll on into the party wearing this all purple zoot suit by Alberto Nardoni. It's not everyday that you're going to be donning one of these 1940s style zoot suits but when you do, you better do it right. 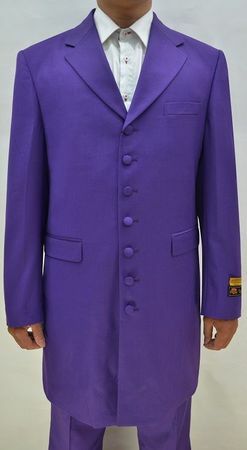 This purple color zoot suit features a 37 inch long jacket with seven buttons that falls almost to the knee with notch type lapels with the matching vest and pleated pants. All made of fine super 150s poly/rayon with fine wool feel.